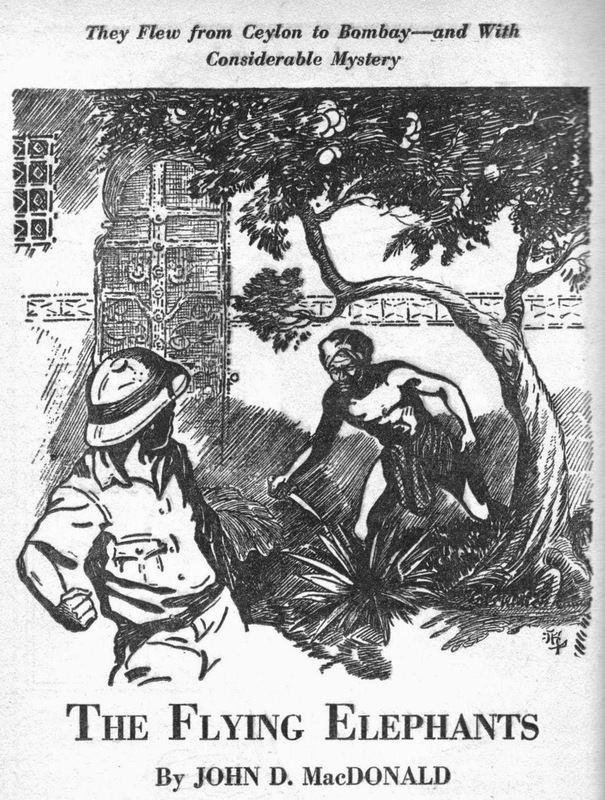 The Trap of Solid Gold: "The Flying Elephants"
The vicarious adventurer could pick his thrills from a huge stack of magazines, at the bottom of which were any number of cheap Western and knockabout action titles, and at the top four eclectic content publications -- Adventure, Argosy, Blue Book, and Short Stories -- considered to be the crown jewels of the pulp world. These four offered higher pay -- three or four times the norm -- and prestige, at least by rough-paper standards, and in return demanded “slick” quality prose and story construction, realism and authenticity. The regular contributors to the top adventure magazines were the pulp community’s elite, and many a successful pulpster would fail to ever crack this lofty market even after years of trying. “The Flying Elephants” doesn’t contain any of those particular kinds of adventurers, but if Short Stories wanted realism, MacDonald could provide it. Only a year earlier he had been stationed in Ceylon during the Second World War, and he could write about the locale’s particular atmospherics with vivid detail. Many, many of MacDonald’s earliest short efforts took place in either Ceylon or India, where he had been stationed before being transferred to the island nation that eventually changed its name to Sri Lanka. At one point it became so automatic for the author to set his stories in the Far East that one of his editors eventually had to admonish him to “take off his pith helmet.” But while he wore that helmet this part of the world was his favorite locale -- in fact the second story JDM ever had published -- “The Game” -- took place there and the careful reader can spot lots of similarities in both stories. Several of the scenes take place in identical locations -- a club, a hotel bar, a moonlit beach with a seawall -- and these particular places, where MacDonald undoubtedly frequented himself, would show up in many subsequent short stories. Bill Drucker isn’t a cowboy, or an explorer, or a pirate: he’s a salesman, one of what would become a long line of working-stiffs-as-hero in the MacDonald canon. He is employed by the Purtron Oil Company and is working out of their Colombo office, but as the story opens he is about to become an ex-employee. He has just received a copy of a letter his boss T.F. Carson has mailed to the head office in the states, and is angry and heading to the Colombo Club to assuage his anger in gin and ginger beer. He unfolded [the letter- and his eyes flickered across the remembered phrases; he almost knew it by heart, "have to admit that Mr. William Drucker is unsuited for employment with the Ceylon office of this company... during his three months he has demonstrated that he cannot effectively sell our products--- vague and indifferent in his approach to his work... inferior technical knowledge and ability... unstable and hot headed--- a liability to my present operations--- that he be returned to the States as soon as a replacement arrives." This has come as a complete shock to Drucker, as he loves his job and the station, and has been quite successful at selling the company’s products. When he attempts to argue the point with his boss, Carson blows him off: "Everything I have to say is in that report, Drucker. I'll expect you to do as well as you can until the replacement arrives, and then you'll be sent home." Completely baffled and not knowing what he could have possibly done more to lose his job, he decides to tie one on with an old buddy, an Anglo-Indian pilot named Casey Lal, who flies the Bombay-Colombo run for a small airline. Casey is due in and Drucker gets in his car and makes the trip to the airport. Here we get a taste of MacDonald’s sense of locale and what must have interested the editors of the magazine. During the twenty-minute drive out the Galle Road through Bambalapitiya to the Ratmalana Airport, he handled the sedan automatically, weaving around the rickshaws and ox-carts, and little fragile British cars. At one point he passed an elephant swaying ponderously along the shoulder of the road. An oncoming lorry made him swerve close to the elephant, and he unconsciously flinched as the tail of the big beast swung toward his windshield. He grinned at himself, and felt better for the rest of the ride. He turned left at a huge coconut plantation and rolled to a stop near the administration buildings at the airport. Casey agrees to go drinking with Drucker, but says that he has to meet a man at ten at the Grand Hotel. Drucker suggests that they go there to do their drinking, and on they go. After several pitchers of arrack punch and story after colorful story from the mouth of effervescent Casey, the two friends are stewed: Drucker has temporarily forgotten his imminent unemployment and Casey is barely sentient. Then Casey's appointment arrives. [Drucker] looked down at his glass and then looked up to see a third person sitting at the table with them. He shook his head, half expecting the vision to fade, but it didn't. The stranger sat calmly staring at Casey and waiting for a chance to break into the monologue. He was a middle-aged Singhalese, with a long, mournful face that made Bill think of a chocolate bloodhound. He giggled, and the man looked at him with such sad, abused eyes that Bill went off into a fit of half-drunken laughter. The stranger was dressed in a white shirt, a flowered sarong and a British tweed coat, as thick as a carpet. The Singhalese is introduced by a drunken Casey as Doctor Purayana. The doctor is carrying a package wrapped in paper the size of a football, which he gives to Casey and then leaves. Drucker asks what is in the package and Casey, too far gone to be circumspect, tells Drucker that it is an elephant. An unbelieving Drucker insists that he be shown for himself. Casey clawed the paper off the package. It was indeed an elephant. A large, cheap ebony elephant, not very well carved, the same sort of elephant that you see in a thousand shops in Colombo. It stood on the crumpled paper, gleaming blackly in the lights, with bits of bone carved and stuck on it for tusks and toenails. Casey also pulls a hundred rupee note from that paper, and when Drucker asks about that, Casey explains that it is his payment for taking the elephant to Bombay and delivering it to a man with “speckled hands.” The money is also so Casey will keep his mouth shut about the arrangement. He tells Drucker that he delivers a new elephant every three weeks to the man in Bombay, and that otherwise he has no idea what is going on. "Don't know and don't care," says Casey. "All I want is the rupees. They look like plain elephants to me." Then, sobering up enough to realize he has said too much, Casey gathers up the elephant and its wrapping and leaves. As John D MacDonald stories go, “The Flying Elephants” is fairly primitive, which is certainly understandable given the fact that it is very early JDM. What qualities the writing has in evocative and exotic locale are more than offset by the real lack of characterization that would come to be a hallmark of MacDonald’s writing. Also, the plot is pretty obvious and the ending, meant to be a surprise, is anything but. (I guess you could say that about 95% of all pulp magazine stories.) The main recommendations for this story, apart from satisfying the cravings of the completists, is in its illustration of MacDonald’s development as a writer. He has a long way to go from “The Flying Elephants” but he got there pretty quickly. MacDonald would go on to have several stories published in each of the four “crown jewels” of the pulp world, although Argosy was no longer a pulp magazine by the time his name graced its table of contents. 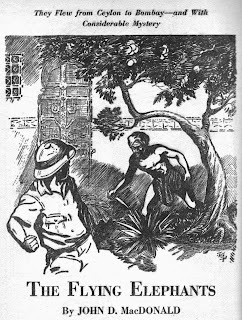 It had ceased being published as a pulp in 1943 and gradually morphed into a men’s adventure magazine. Adventure followed the same suit in 1953, while Blue Book (or Bluebook) didn’t change until 1960, although its metamorphosis began as far back as the early 1950’s with an increasing reliance on non-fiction articles. Even Short Stories could not avoid this fate. 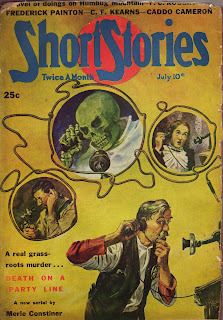 After an increasing reliance on reprints -- stories from both its own earlier issues as well as those from other pulp magazines -- It made it all the way to 1959 before becoming Short Stories for Men. After that it quickly folded. “The Flying Elephants” has never been anthologized or -- as far as I can tell -- reprinted since its original appearance in 1946. I enjoyed this article quite a bit. I collect and have extensive runs of all four of the major pulps that you mention. My favorite is ADVENTURE, followed by SHORT STORIES and then BLUE BOOK and ARGOSY. For almost 30 years SHORT STORIES came out every two weeks with the best in adventure fiction, 1921-1949. That's hard to believe now that we don't care about short fiction like we used to. I guess that's why I collect old fiction magazines. I miss the days when the newsstands were full of magazines with interesting fiction.